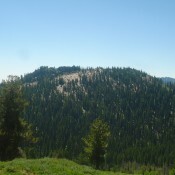 This peak is located southwest of Paris Peak and can be climbed along with White Face Peak which sits just to to its west. This very interesting peak is what separates the N. Forth Bloomington drainage from Bloomington canyon. What it lacks in elevation gain it makes up for in interesting features. Its summit is part of a long, east-west trending wall of rock towers. Approaching from the East the mountain is a pretty straightforward class 2 climb. From the west though it is a solid class 3 climb with serious deadfall in the forest below. There are some areas that could get into the class 4 area but they can be avoided pretty easily. The true summit is difficult to pinpoint because the towers on the wall are nearly identical in height but I believe the true summit lies close to the eastern end of the wall. There is a single tree growing on it and a massive crack directly below it to the east. This amazing mountain is a great scramble and it’s worth the trip up just to check out the neat rock formations that make the “castle” on the top of “Castletop” Again, there was no sign of previous visitation when we were there and no record online of anyone climbing it, but I find it hard to believe that no one has ever set foot on the peak before. Drive up Bloomington Canyon Road/FSR-409 from Highway 89 at the south end of Bloomington, ID. At 7.9 miles, you reach the road junction with Middle Fork Road/FSR-426. Either park here (7,340 feet) or drive a mile up the road (which has a large, watery mudhole about ½ mile up the road) to reach the road departure point. 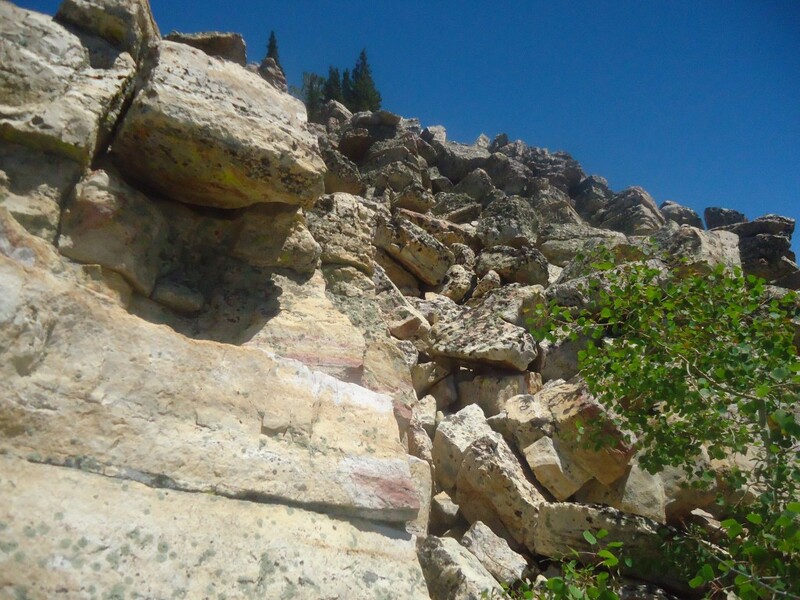 The south sides of Peak 8852 and Peak 8963 are a steep, ugly mix of boulders and trees. 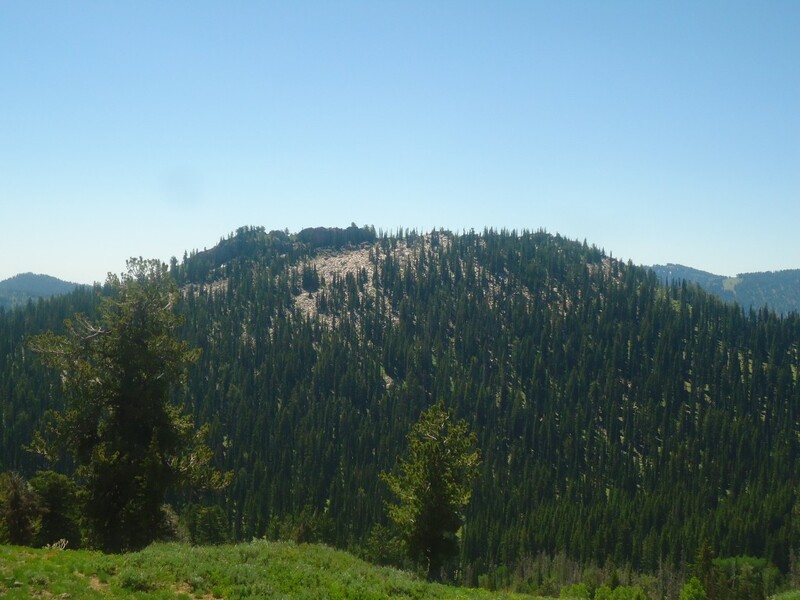 This rough, if not impossible, bushwhack is readily visible from the Middle Fork Road. However, Peak 8852 does have one weakness on its south side: the Southeast Ridge. From the base of Middle Fork Road (at its junction with Bloomington Canyon Road), hike W up Middle Fork Road for just under a mile to reach a clearing below the W side of the Southeast Ridge. This clearing provides the easiest access to the ridge. Leave the road here at 7,500 feet. Bushwhack NE through desert scrub and thick aspens to reach the Southeast Ridge. Getting up onto the forested ridge requires a Class 3 maneuver to pull yourself up onto the ridge crest using aspen limbs. 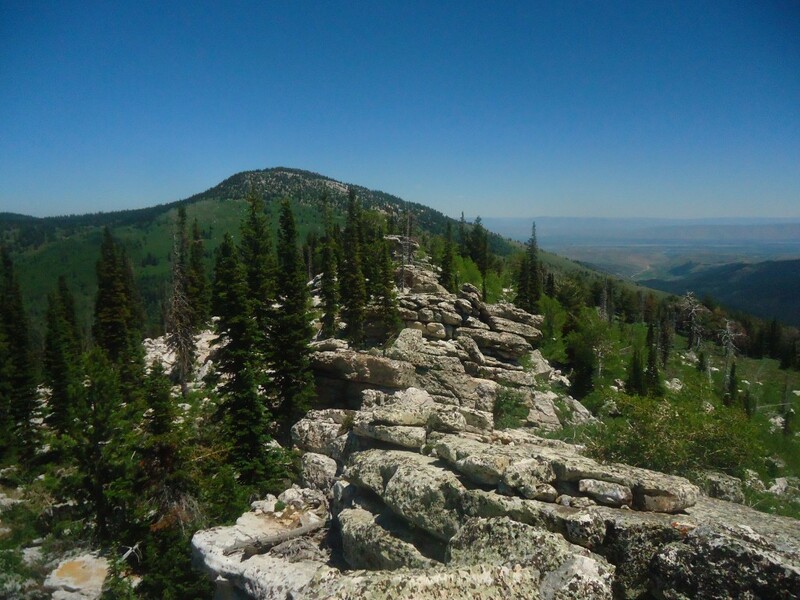 You should reach the ridge in just under 15 minutes and surmount the ridge crest at 7,825 feet. The R/E side of the ridge crest is open scrub, with the early morning sun to warm you. Follow the Southeast Ridge northward on relatively easy desert scrub. Stay close to the ridge crest, as the veg farther down is very thick. No game trails or cattle trails to help. Wild animals and livestock are smart enough to stay away from this area. At about 8,500 feet, the ridge turns L/W and becomes a mix of forest, rocky outcrops/boulders, and desert scrub. The summit area is a row of large rock towers/blocks with trees mixed in to make it a difficult area to traverse. I can confirm that the high point is at the eastern end of this blocky, narrow ridge crest. The highest boulder/tower is just on the W side of a sturdy pine tree that splits the tower (as Matt Durrant points out). To stand on that high point, you must make a Class 3 maneuver (holding the angled tree trunk with your left hand/arm) across the exposed gap in the rock to stand on top of that massive boulder/tower. Views from the summit are negligible due to the surrounding forest, but you DO have a view directly WSW of the line of rocky ridge blocks/towers. It APPEARS that you are on the high point, but you can’t be sure. The other towers are of similar height but, as the USGS map suggests, the high point IS at the eastern end and you ARE standing on it. Just to be sure, I measured the other “high” towers and none of them were quite as high as the eastern one. There was no cairn or register atop this peak. There were no loose rocks available to build a cairn; else, I would have done so. 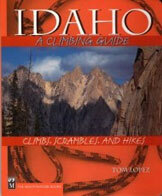 Should you enjoy misery, continue by reading the West Ridge Route (DESCENT) which was the next leg of my adventure. If you plan to bag Peak 8963 as well, that route is the easiest way to get there from here. Like the summit cap of nearby Paris Peak, the mountain tops in this area are a wicked combination of large boulders (or blocks/towers) and trees, with a dollop of veg mixed in. That includes Paris Peak, Peak 8852/Castletop Peak, and Peak 8963/White Face Peak. Nearby Peak 9270/North Paris Peak and Peak 8974 are NOT of the same genre and are much easier mountains to climb. The West Ridge of Peak 8852 is only a half-mile in length and only requires a 400 foot descent. 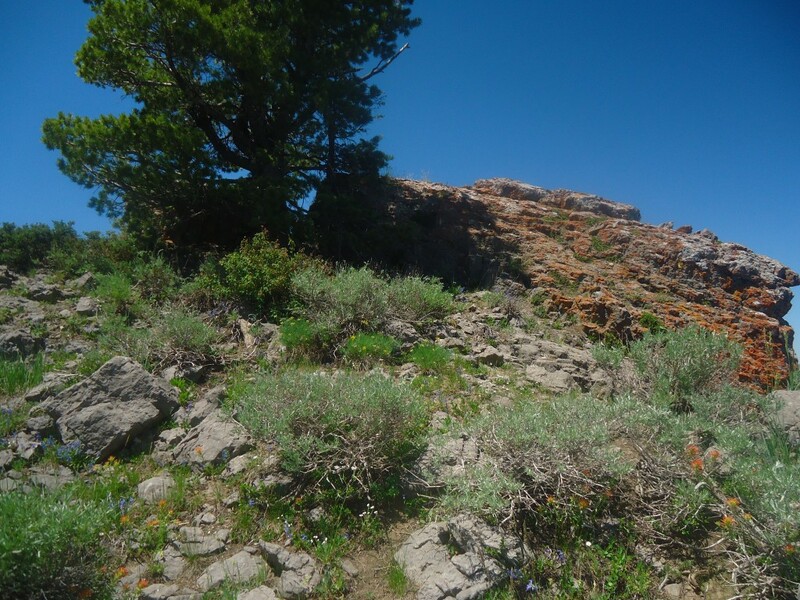 But it is a brutal bushwhack across and then down a combination of large boulders (towers/blocks on the 0.2-mile summit crest), trees, and veg. You will have to work to keep this at a Class 3 difficulty, as it’s quite easy to make it Class 4 or worse. 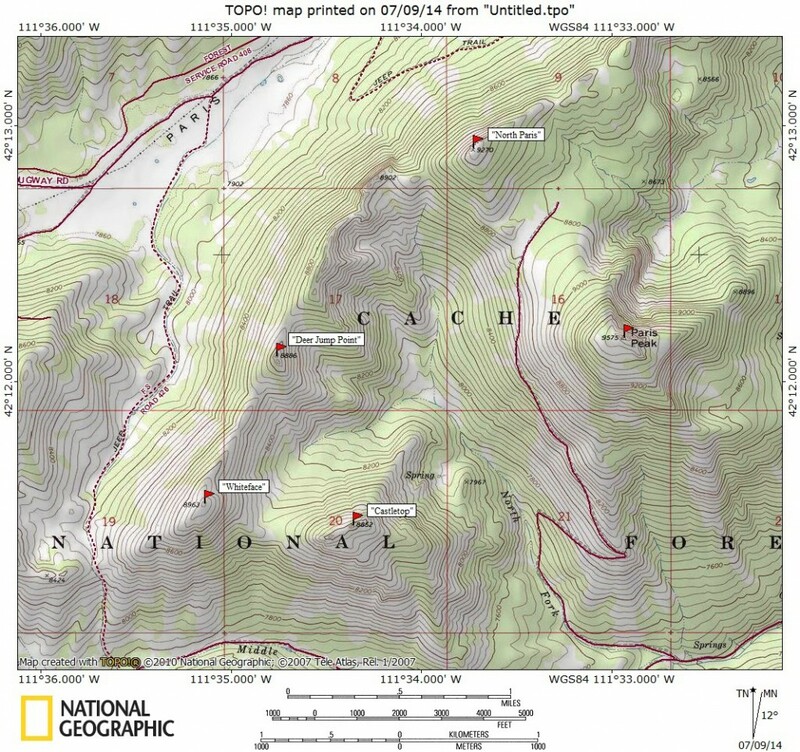 Stay to the R/N of the ridge crest itself, which is at least Class 4. Thanks to the thick forest, visibility is nil. Needless to say, there are no game trails or cattle trails to help out. Not even wild or domesticated animals are dumb enough to struggle with this sheer awfulness. As you approach the saddle at the base of the West Ridge, the slope eases and the boulders disappear. At the 8,460-foot saddle, the forest ends and the terrain opens up.